Heat oven to 350°F. Make and bake cake mix as directed on box for 24 cupcakes. Cool cupcakes completely on cooling rack, about 15 minutes. Reserve 2 tablespoons frosting. Place remaining frosting in medium bowl; tint with yellow food color. Frost cupcakes with yellow frosting. Use kitchen scissors to cut 1/4-inch circles off both ends of 16 marshmallows to make 32 total rounds. Use reserved frosting to stick milk chocolate candies to marshmallows. 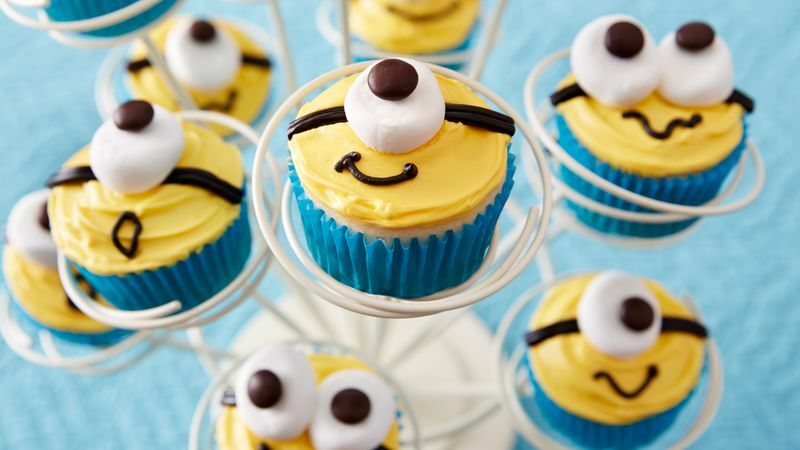 Place marshmallow eyes on cupcakes, placing two eyes on some cupcakes and one eye on others. Cut 2 small pieces of licorice rope for each cupcake. Place licorice rope pieces on sides of eyes. Use black decorating gel to pipe a mouth onto each cupcake. Bake cupcakes in blue paper baking cups for an added decorative touch!